FPGAs are best known for their flexibility and versatility. Such flexibility allows FPGAs not only to be used for custom logic circuits but also implement a processor on it and even run Linux (or other operating system) on the processor. The possibilities are only limited by imagination, and also by FPGA speed grade and size. This article will discuss how to create/implement Microblaze processor and run Linux on Mimas Artix 7 FPGA Development Board. This series is based on our article series for Neso Artix 7 FPGA Module. So we highly recommend that you read the series for Neso and get yourself familiar with the steps. So let’s dive right in. Creating a Microblaze based design for Mimas A7 is very straight forward. Detailed steps for creating Microblaze based design is available in this article. 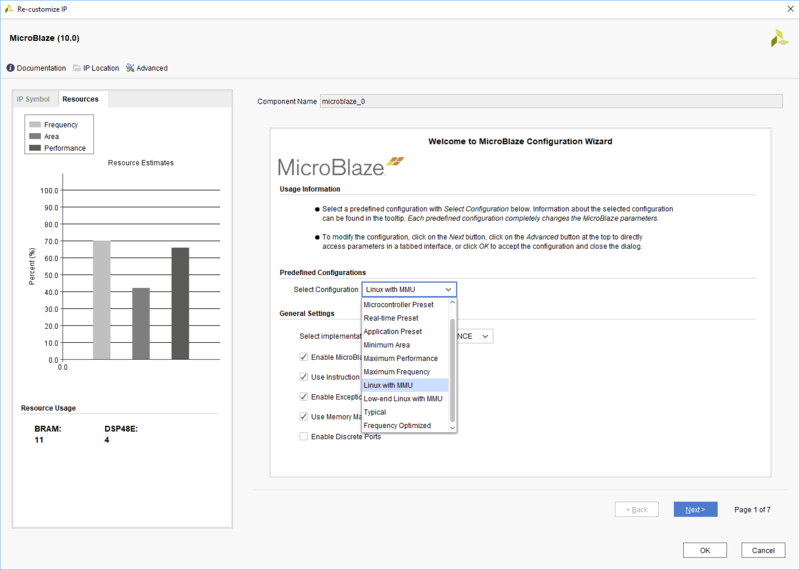 Please go through this article and follow the steps to create a Microblaze based design. Make sure Hello World and Memory Test Program runs and passes all tests. To run our Linux system, we will be modifying the above created Microblaze based design. We need to modify this Microblaze IP block to be able to run Linux on Mimas A7 board. Open the above created block design, double click on the Microblaze block and choose the Select Configuration as “Linux with MMU” as shown in the image below. Also we have to change the baud rate of UART. Double click on “uartlite” IP and set the baud rate as “115200”. 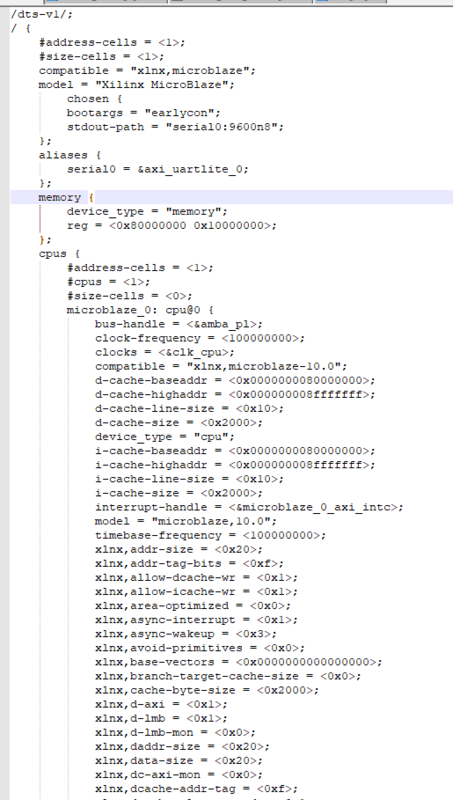 Now, the Microblaze based Linux capable design is completed. Click “Genetrate Bitstream” in the program and debug. Once the bitstream is generated successfully, export the hardware along with the bitstream. We will launch SDK later in next section. On many platforms, Linux kernel depends on a data structure called Device Tree to discover and configure different hardware components available on the board. Kernel uses the device tree in binary format which is generated by using device tree compiler. The input to the device tree compiler is a text file (with extension .dts) that describes all the hardware and dependencies. This file can be edited manually by hand if necessary. But fortunately, there are tools available that can help us generate device tree from our Vivado/SDK projects. Having completed all the steps before, now download the device-tree repository from Xilinx’s github account: https://github.com/Xilinx/device-tree-xlnx. If you downloaded the zip file, extract it in the same location as your SDK workspace. The author extracted it to “C:\mimasa7\mimasa7.sdk\device-tree-xlnx-master” directory. To generate Device tree follow the steps below. Step 1: In Vivado, go to “File” and click “Launch SDK”. This will launch SDK. Step 2: In SDK , go to “Xilinx/Xilinx Tools” and click “Repositories”. 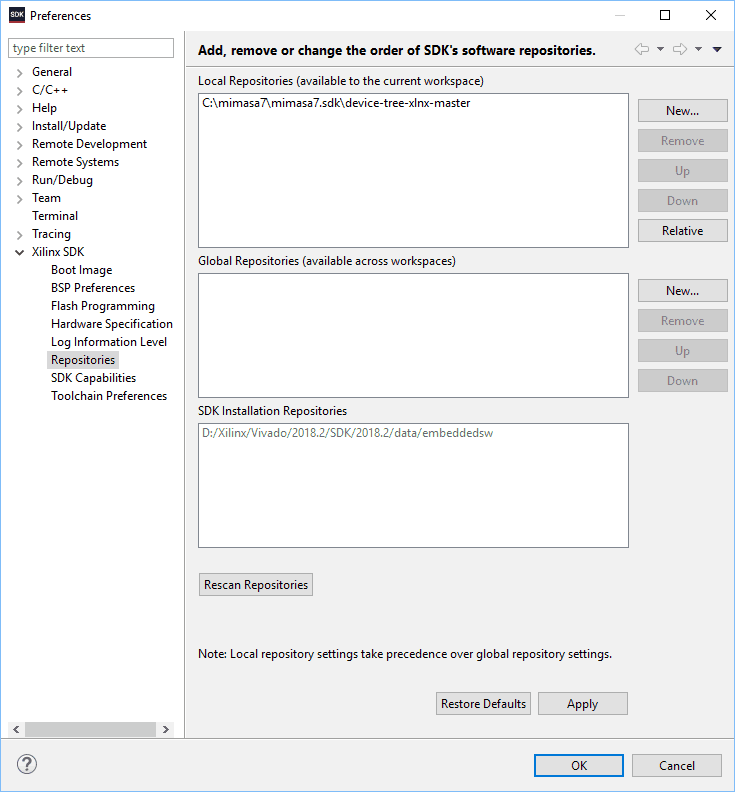 Step 3: In the dialog window, select “New” and select the device tree folder which you had downloaded and extracted to SDK workspace in the “Local Repositories” section. Click “OK”. Step 4: Go to File -> New select “Board Support Package”. In the Dialog window, select “device_tree” under “Board Support Package OS” and press “Finish” and then “OK” in another dialog that opens. This should generate a system.dts file along with a .dtsi file. We need both of them. Now, save this modified file as “mimasa7.dts”. 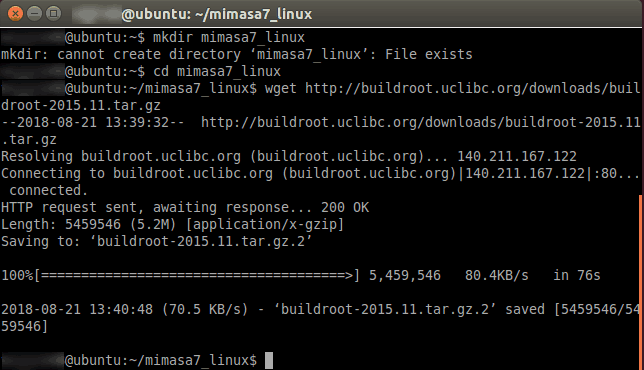 And copy “mimasa7.dts” file to your Linux System. Now we need a Linux system to build Linux Image. In this article, author used Ubuntu 14.04 64-bit for building Linux image. All extracted files should be in the “buildroot-2015.11” folder. Step 3: We need Linux kernel defconfig file for Mimas A7. Get the defconfig files from here. mimasa7_defconfig file: place it under the directory “buildroot-2015.11/board/numato/mimasa7/” You will need to create respective directories named “numato” and “mimasa7”. Please note the kernel base address is set to 0x80000000 in the Linux kernel defconfig file. Please change it appropriately if the DDR3 base address is different in your Vivado project. 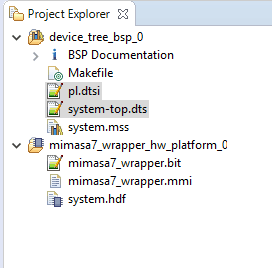 Now copy the “mimasa7.dts” to the same folder as well. Now, buildroot defconfig file “numato_mimasa7_defconfig”: copy it to the “configs” folder inside buildroot root directory (i.e. “buildroot-2015.11/” ). Before executing the above command, please make sure that Python and OpenSSL header files should be installed in the Ubuntu system. If these files are not installed in your system execute the following commands to install. After successful completion of installation of those files, execute the “make” command. 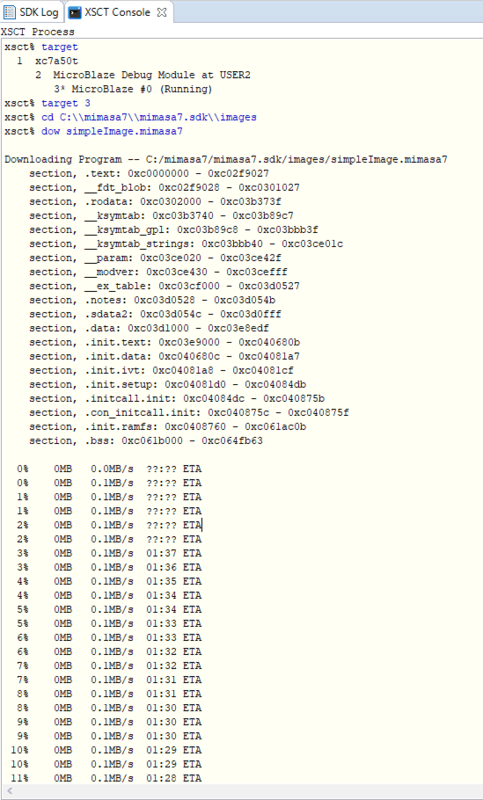 This command will build the kernel and its file system. This downloads the kernel sources and lots of other tools from internet. It will take some time to finish building the kernel image, from 30 minutes to over an hour, or even more, depending on your machine’s capabilities and your internet speed. After completion of the above steps, a linux image “simpleImage.mimasa7” will be created in the directory “buildroot-2015.11/output/images/”. This is the Linux kernel with root file attached to it. We will use this file to boot Linux on Mimas Artix 7 FPGA Development Board. Step 1: Copy the Linux image and place it in a convenient directory. 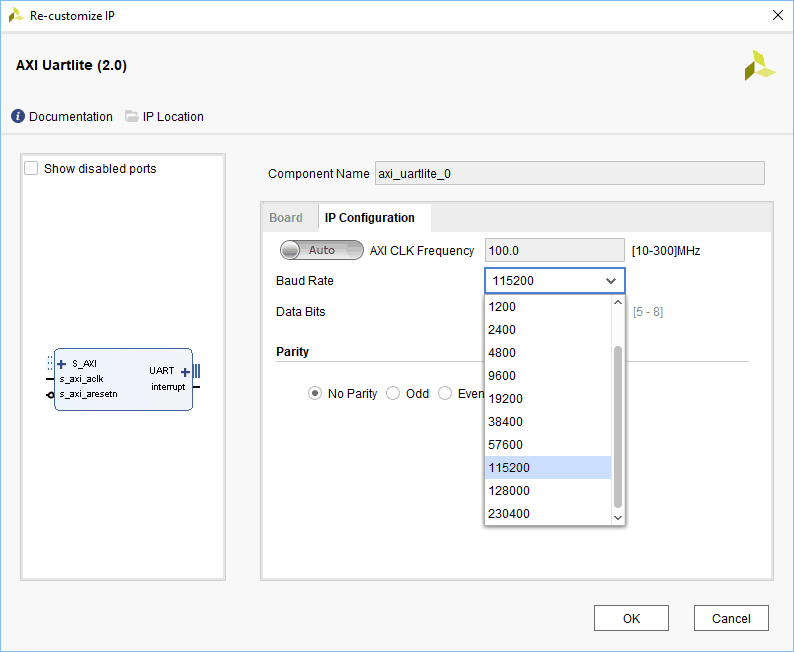 Now open SDK and connect the Xilinx Platform Cable to the Mimas Artix 7 FPGA Development Board and power it up. Make sure the FT2232’s channel A is configured for RS232. Open any Serial terminal program (CoolTerm, PuTTY, Tera Term etc.) at baud rate 115200 and connect it to Mimas A7. You can login to Linux with username “root” and password as “mimasa7”. 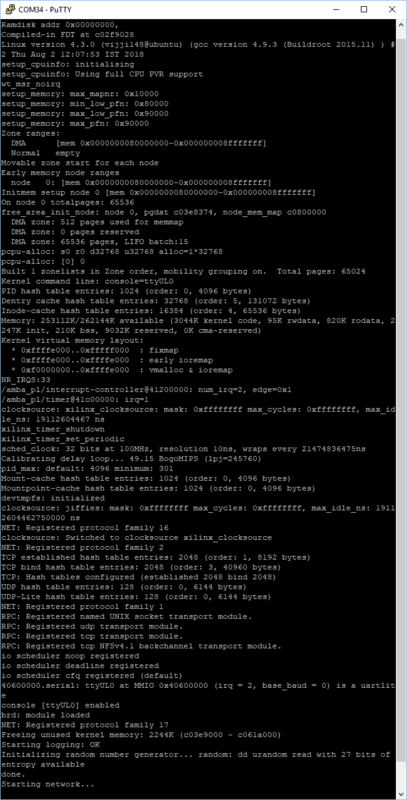 Now we have a successfully running Linux kernel in Mimas Artix 7 FPGA Board. Congratulations! In the next article, we will see how to flash kernel image to the onboard SPI Flash on Mimas A7!